California Family Foods mills only the finest grade of Non-GMO medium and short grain paddy rice from local growers in the Sacramento Valley. We cultivate excellent relationships with our growers, offering seed financing and competitive green freight rates in order to attract premium raw product. Product standards and customer specifications most commonly requested are USDA #1–4% or better. The driving forces behind the high quality of our brown and milled rice are our resolute commitment to the highest standards of production along with a disciplined quality assurance program. Kathy Foster, Quality Assurance Manager, developed and currently oversees a meticulous quality assurance process that results in a premium product. The BRC Global Food Safety Standards is a leading global safety and quality program to facilitate standardization of quality, safety, operational criteria and manufacturers’ fulfillment of legal obligations help provide protection to the consumer. OMIC standards apply to all products being exported. Criteria analyzed include broken content, moisture content, whiteness, defects and labeling requirements. All California Family Foods products are Kosher certified. A quality assurance program such as this is ongoing and ever-improving. It takes the expertise and careful attention of many talented employees to test product quality around the clock. California Family Foods is proud to employ a team of individuals who work every day to ensure all our products meet the rigorous standards of our quality assurance program. 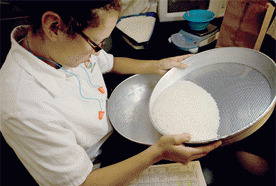 Mill Quality Assurance Inspector Linda Araujo completes a scheduled sampling of California Family Food's medium grain Calrose milled rice.